Even with all the world’s gemstones to play with, there’s nothing quite like a fantastically decorated cabochon to set one’s design heart dreaming. 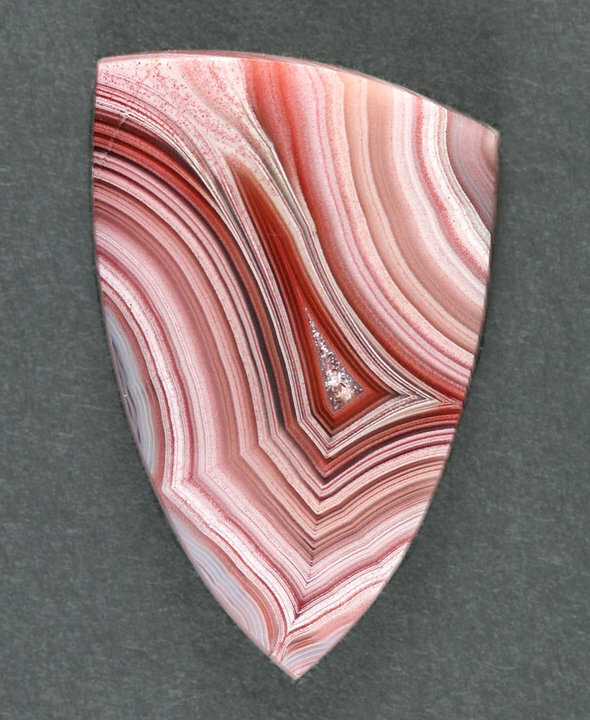 Stones like this unusual cabochon I’ve used seem so unreal in their intricate patterning… But this Crazy Lace Agate is almost tame compared to some! Agate (pronounced /?æ? ?t/) is a microcrystalline variety of quartz (silica), chiefly chalcedony, characterised by its fineness of grain and brightness of color. Although agates may be found in various kinds of rock, they are classically associated with volcanic rocks but can be common in certain metamorphic rocks. Very abstract and esoteric, right? So we’ll move straight into the eye candy portion of today’s post! 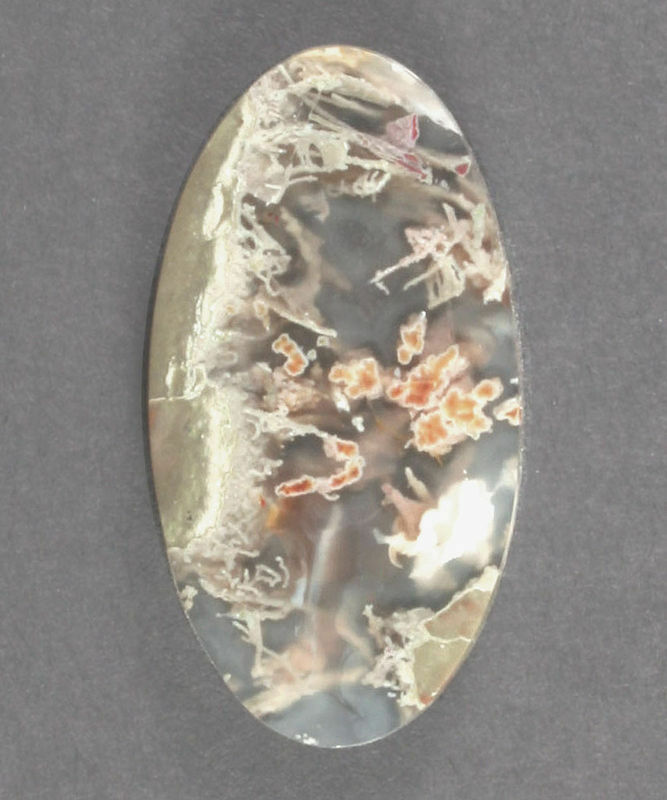 Courtesy of Gerard Scott Designs, one of my absolute favorite designer cabochon studios, I bring you my top picks for unusual agates! This agate is a Priday Plume Agate, and was found many years ago on the Priday Ranch outside Madras, Oregon. Stunning, isn’t it? Partially translucent, but with amazing fingers of color and pattern. This almost geometrical agate is a Botswana Plume Agate. Found in Botswana, Africa, this stunning stone is said to help one on the way towards enlightenment. I don’t know about that, but studying those wonderful patterns and plumes would surely help anyone! Would you believe the two above stones are both Laguna Agate from Mexico? Amazing, I know. The color variations between even agates of the same type continually astonish me. Drenched in such a hot color, is it any wonder that this Sonoran Plume Agate is born in one of the hottest deserts North American deserts? After the strong, stunning colors of the previous agates, this lovely and serene Ochoco Moss Agate is a study in elegant simplicity. This agate is a Horse Plume Agate, and for all it’s amazing array of colors is quietly elegant, and absolutely stunningly detailed. I’m sure you’ve noticed by now how much I really love fabulous agates! Now, no overview of Agate would be complete without a lovely Agate Druzy! The same process that forms the bands of colors and pattern usually leaves pockets of gas in the cooling stones that have turned into lovely druzy crystals. 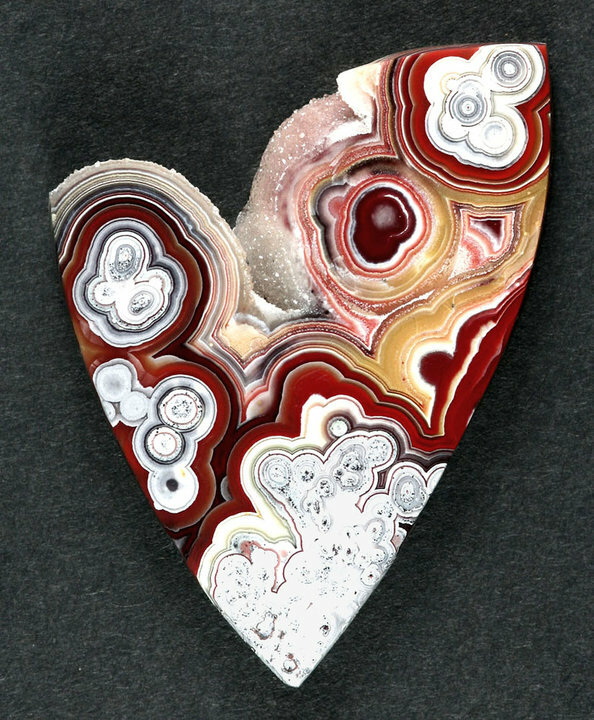 And so I end my post with another Crazy Lace Agate. Glorious stones like this druzy vision are so amazing…. Green, red, orange, pink, clear, gray, purple, blue, lavender, teal…. Agate covers the full spectrum of colors, a fabulous piece of fortune for which my designer’s eye can only rejoice with complete abandon! There are hundreds of different agate variations- more than I can possibly hope to capture in one blog post, but I hope you’ve enjoyed the introduction. If you’ve enjoyed this selection of stones, you can find more from Gerard Scott Designs on their Website, or on their Facebook page. Holy cabochon Batman, I’ve never seen agates like these. Absolutely beautiful, and then some. I’ve seen agates over the years, but they pale into insignificance after seeing your pictures. Rarities I suspect, and expensive to boot. P.S. Isn’t a metamorphic rock, volcanic in origin? Hi Howard! Aren’t they fabulous? I love the complexity, the variety, and most of all- the prices. These are pound for pound a usually inexpensive stone, simply because agates are found all over the place. So rare has a rather elastic definition in this case. Rare only because not many people know about them, and few people cut them or use them in large scale in jewelry, not because there’s a lack of stone. The most expensive piece I shared is probably the Sonoran agate, but I think that’s partly due to the current craze over it on top of being somewhat difficult to cut- or so I hear. I have yet to delve into the art of stone cutting, but I hear the siren call more and more these days! As far as metamorphic rock being volcanic, that’s only partially accurate. All rocks are related in some way to volcano activity, simply due to the cycles that rocks take. Igneous rocks are actually closest to truly volcanic in nature, being formed directly from molten lava flows, and turning into different rocks due to the rate of cooling, and the minerals present. So mountains, such as Ranier and Mt. St. Helen’s in the US, as dormant volcanoes, are mostly comprised of Igneous rocks. Then places like the Appalachian mountains are fairly sedimentary, as they are older, and have weathered and aged into a more crumbly series of rock types. Metamorphic rocks, like Agates, are igneous or sedimentary rocks that have been changed due to pressure and great heat- but not necessarily a volcano. All very nifty and scientific, but I still think they’re just plain gorgeous! If you’d like to know more, you can find some introductory information about rocks and their formation here. Which one is the Sonoran agate? I didn’t see that name in your titles. 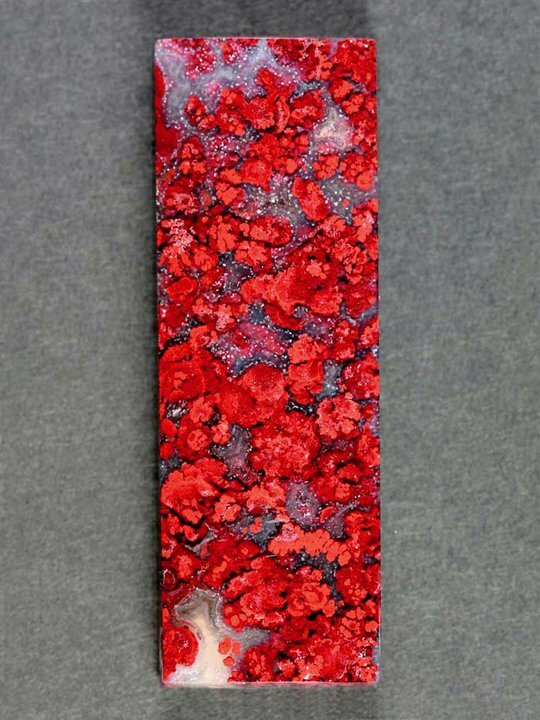 My favorite is the red plume agate. Looks like a field of bright red poppies to me; actually they are all fabulous.